Throughout 2015, Oxford Brookes is celebrating its history, achievements and the future of the University as it reaches its 150th year. As part of these celebrations, the Alumni Office are hosting an International Wave across the world, which will give all of our alumni a chance to get involved in the celebrations through country-specific events and reunions. 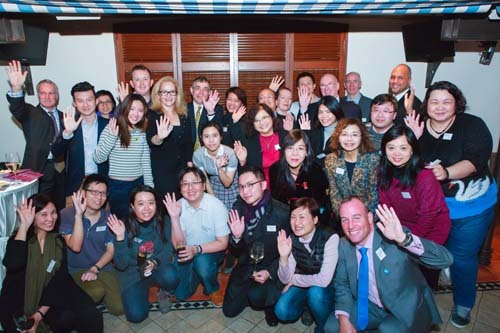 To launch the International Wave, the Alumni Office and the Hong Kong Alumni Chapter hosted an alumni drinks reception at the Foreign Correspondents’ Club in Hong Kong on Tuesday 13th January 2015. More than 30 alumni who are living or working in Hong Kong were able to attend the drinks reception, where they were greeted by several members of Oxford Brookes staff, and a welcome speech delivered by the new Vice-Chancellor Professor Alistair Fitt. The reception was an opportunity for Oxford Brookes to build international relationships with Hong Kong University and City University Hong Kong, as well as a chance to meet with representatives from other partner institutions in the area. During the evening, alumni were able to build new connections with those in the area, to reunite with old friends over refreshments and to celebrate their successes and achievements since graduation. The event was very well received and marks a successful start to the International Wave, which is set to continue throughout the anniversary year.